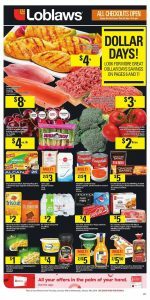 Loblaws Flyer Dollar Days 15 Jan 2019 is available to check here online. Dollar days are on and time to saving your money. Look for more great dollar days savings on page sixth and seventh. You will see how they are cheap and good. Fresh produce and low prices waiting for you in there. Click on the image and get more information about all Loblaws deals. Healthy fresh Pacific salmon on sale this week. Healthy food ideas available in this flyer. Loblaws Flyer Dollar Days 15 Jan 2019 is the perfect choice if you are looking for daily beasts of Loblaws. Perfect deals and healthy food opportunities are available here. Do not got anywhere else and full your shopping cart here. Dollar days will make your wallet happier. For a better shopping experience, you must visit the Loblaws store. Enjoy your shopping everyday of this week!